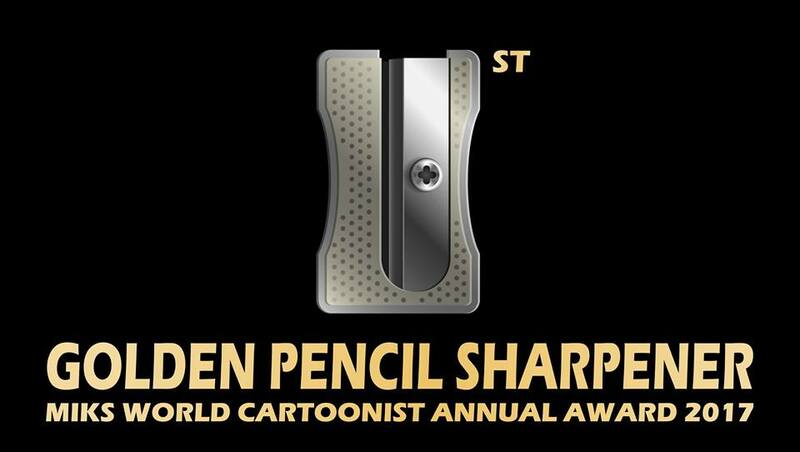 Annual Award ‘Golden Pencil Sharpener’ is awarded by the International Cartoonist Association MIKS for the best artistic cartoon achievements in the world. 3) Award for the Cartoon Promotion in the world for an individual/association for the outstanding achievements in cartoon promotion in the world. a) Annual Award is given to cartoonists for their best artistic achievements published, exhibited or shown during the previous year. b) Lifetime Achievement Award is given to prominent world cartoonists whose work has marked the period while they were active and whose creative path is completed while their work remains a permanent value in the cartoon world. c) Award for the Cartoon Promotion in the world is given to organizers of international cartoon exhibitions (contests), magazines publishers, journalists and all other individuals and associations which have contributed cartoon promotion in the world during the previous year, as an encouragement for their further work in quality cartoon promotion in the world. The Award is given by an International jury of the ‘Golden Pencil Sharpener’ Award proposed by the President and approved by the presiding Committee of the International Cartoon Association MIKS. The International jury consists of a minimum 12 members (maximum 30). The International jury operates on the Internet. An Elective Committee of 4 members is formed in order to nominate the candidates in all categories, based on their achievements. 3) Cartoon Promotion Award – 3 candidates. Every member of the International jury (on a forwarded form) circles only one candidate in each category and authenticates the Form with the date and signature. The Form must be printed, candidates must be circled by hand and the date, place and handwritten signature filled in. After that the Form should be scanned and sent by e-mail to: cartoonmiks@gmail.com (by 3 May 2018). If some members of the International jury are listed as candidates, they cannot vote for themselves. Members of the International jury can be cartoonists, contests organizers (festivals, exhibitions), publishers and/or journalists in professional cartoon magazines and art historians. 3) Award for the Cartoon Promotion in the world consists of a plaque, a diploma and an invitation to the jury of the International Cartoon Exhibition in Sisak (MIKS). ‘Golden Pencil Sharpener’ Awards for the previous year are given at the opening of the International Cartoon Exhibition in Sisak (always held at the end of June). Victory ceremony for the First Prize will be held on 29 June 2018 during the opening of 4th MIKS in the Town Museum in Sisak (Croatia). Awards are sent by mail, along with the invitation to the International jury of the MIKS exhibition for next year. One-man shows of the winners of ‘Golden Pencil Sharpener’ Awards are arranged for next year, in consultation with the laureates. Dates and signatures of all members will be delivered subsequently.